INDIANAPOLIS, IN - Firestone Industrial Products' versatile Inflation Station portable air compressors are the perfect accessory to have on hand during family vacations, camping trips, sporting events and more. Available in two models, Firestone Inflation Stations are designed to instantly supply up to 150 psi to inflate Ride Rite(tm) springs, tires, air mattresses, swimming rafts, basketballs - whatever needs air. "These compressors are a great addition for toy haulers to deflate and inflate tires while using their toys in the desert. They can also be used to blow the dust and dirt off an ATV or motorcycle. And they're not frustrating to use - our products are so powerful they can inflate a 31x10.5-inch tire from 15 psi to 30 psi in less than two minutes," said Paul Gibson, product manager, Firestone Industrial Products, Ride-Rite(tm) division. Both Inflation Station kits - #9289 and #9290 - include a heavy duty 150 psi air compressor, a 12-foot power cable with brass alligator clips, a 25-foot coiled air hose, tire inflator tool with gauge, two blower nozzles, a needle valve tool and an extra heavy duty canvas carrier. Kit #9289 is the heavier duty product that features a 35 percent duty cycle - 1.69 CFM at 60 psi. The second kit, #9290, has a 20 percent duty cycle and a 1.02 CFM rating at 60 psi. Using the Inflation Stations is quick and easy too. Simply hook the air compressor to a vehicle battery, turn it on and start inflating. 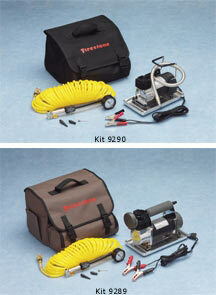 Inflation Stations are available from any Firestone Ride Rite(tm) air helper spring dealer. Suggested MSRP for the heavier duty air compressor (kit #9289) is $362.15, while kit #9290 is $249.27. Firestone offers a two-year limited warranty (see dealer for details). For more information, call toll-free at (800) 888-0650 or visit www.ride-rite.com. In addition to the new Inflation Station air compressors, Firestone offers a complete selection of air suspension products, including Red Label air springs, Ride-Rite, Sport-Rite(tm), Coil-Rite(tm) and Level-Rite(tm) air helper springs. Firestone began building vehicular air springs in 1934 and its products have become synonymous with quality, durability and outstanding customer support. With headquarters in Indianapolis and six manufacturing plants on four continents, the company produces suspension products enhancing the driving experience for drivers of passenger cars, sport utility vehicles, light trucks, minivans, vans, and motor homes. The company's products are ISO quality certified and Firestone Industrial Products supplies its air springs to many original equipment manufacturers.